Religious buildings generally suffer from poor acoustics even though they are perceived as very quiet places. Unfortunately, this is a myth as most of the activities in places of worship involve lots of people inside an enclosed hall or large room. Unlike most other rooms where the occupants are normally counted in 5 or 10 people at the most, religious buildings have occupants which can be up to a hundred ! This presents problems as religious buildings are normally built of solid hard robust materials. This is because such buildings have a working life of many years, often hundreds of years. The use of solid hard materials leads to hard sound reflective internal finishes. Unlike most other buildings , even the benches and chairs are made from hard materials such as wood. The other problem in religious buildings is the very large volumes of the halls. This gives plenty of space for sound to resonate for long periods before dying out. Great for organ music but an impossible situation for trying to hear someone doing a speech or sermon ! 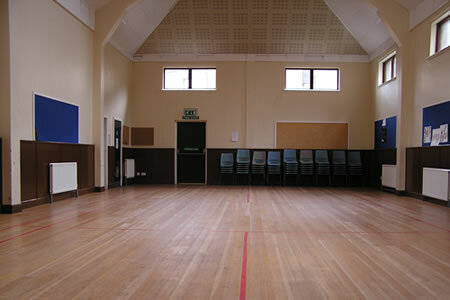 Such buildings are increasingly being used for a host of activities and are becoming community hubs where people meet for a whole range of reasons as well as for religious worship. Common uses are elderly care meetings, children’s nurseries, drop in centres, scout and guides activities, coffee mornings, etc. Unfortunately, they are limited by poor acoustics in such halls when used for different functions. Soundsorba are contacted regularly by religious bodies to help solve acoustic problems in their buildings. The problem of bad acoustics is not confined to the design of any one religions type of building. Churches, Mosques, Synagogues, Gurdawara’s and other places of worship have all come to Soundsorba for help to solve their acoustic problems. Most such institutions have halls or meeting rooms which suffer from bad acoustics. 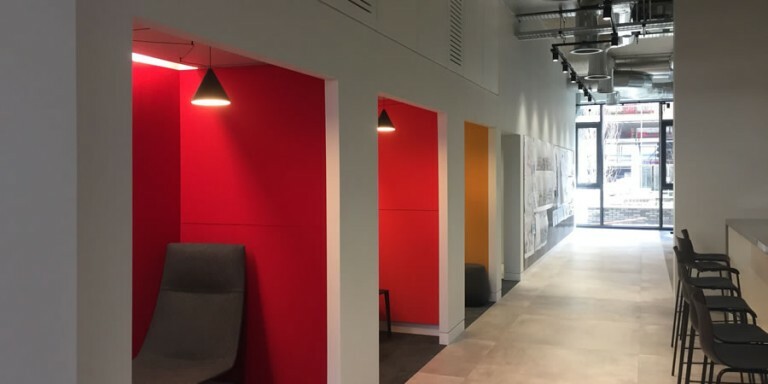 Most halls have high walls and acoustic wall panels are normally the answer in the form of our Wallsorba fabric faced acoustic panels . These are available in a wide range of colours and are extremely popular as the main solution in such halls and rooms. They cover large sound reflective areas with soft sound absorptive panels which add decoration as well as solving the acoustics. Where there is no bare ceiling areas, the Cloudsorba suspended acoustic panels are an appropriate solution to deaden the reverberation in the hall. The height of the panels can be easily adjusted. The panels can be manufactured to different sizes and colours . 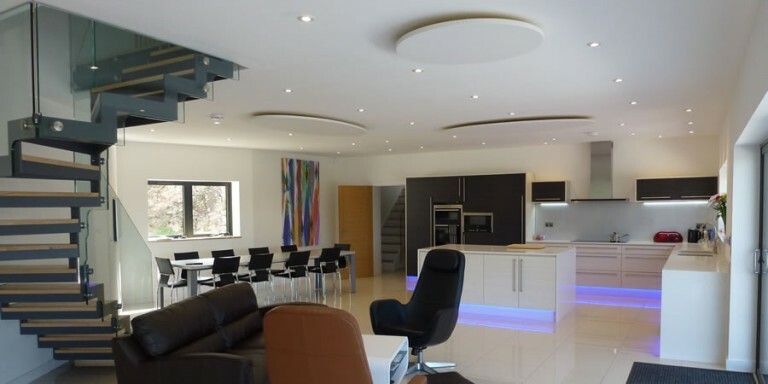 The panels can be positioned between the light fittings hence avoiding any electrical alterations and costs. 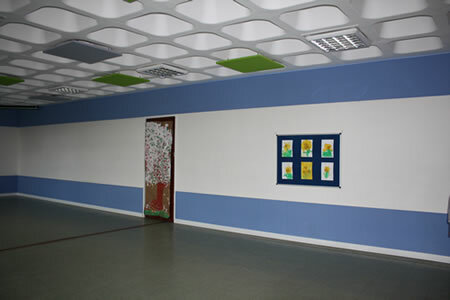 In halls which have low ceilings , the application of Echosorba stick on acoustic panels is the ideal answer. These are only 30mm thick and very lightweight , therefore they do not impose any significant weight loading to the existing ceilings. The D.I.Y fitting keeps the installation cost down to the minimum. Being pre decorated in white colour, no additional decorative work is required. However, these panels can be painted with matt emulsion paint without any significant effect on the sound absorption performance. Halls which have extensive existing timber panelling may need similar visual acoustic treatment. This is provided by fitting the Woodsorba timber acoustic panels which complement such high class aesthetics as they are manufactured from wood and veneered by real wood in a range of finishes such as oak, ash, mahogany, beech, etc. These timber panels can be used on ceilings and walls. Where cost effective but robust acoustic panels are required, then the Toughsorba acoustic panels are idea. These offer an unlimited range of colours along with high acoustic absorption. They are simple to fix and can be used on high level walls and ceiling surfaces. Can be used where ball games may be played. 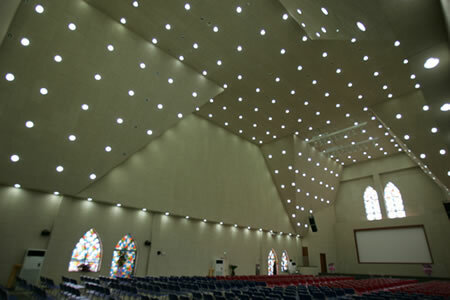 Soundsorba will be pleased to help solve your acoustic problems in your Religious building. Contact us for free technical advice at info@soundsorba.com or on 01494 536888. The recycled glasswool acoustic board provides very good fire resistant properties. This is fire rated as Class 0 to BS476: Part 6. Standard fabric facings comply with Class 1 to BS476: Part 7. Class 0 fire rated fabric finishes are also available on request. Upvc trims are fire rated as BS476 Part 7. Like normal Upvc,the trims have a maximum softening limit of 60°C. The 25mm thick Wallsorba panels weigh approximately 3kg/m², whilst the 40mm thick wallsorba panels weigh approximately 4kg/m². Upvc trims weigh approx. 1kg/length. The panels are designed for long term use in building environments with minimal maintenance. However, the panels can be vacuum cleaned periodically. Any slight dirt marks may be cleaned with a damp cloth or a proprietary cleaner. Cloudsorba 'Fabric' - Recycled glasswool acoustic board provides very good fire resistant properties. This is fire rated as Class O to BS476: Part 6. Standard fabric facing comply with Class 1 to BS476: Part 7. Class O fabric can be used on request. Cloudsorba 'Echo II' comply with Class O to BS476. The Cloudsorba hanging clouds can be cleaned using a vacuum cleaner. Any slight dirt marks may be cleaned with a damp cloth or a proprietary cleaner. The Echosorba acoustic panels meet the requirements of Class 1 and Class 0 of BS476 Part 6 and 7. Class 0 is the highest fire standard required in the Building Regulations. ECHOSORBA acoustic panels resist up to 93% Relative Humidity at 40°C in accordance with ISO 4611. Echosorba acoustic panels provide 78% diffuse light reflectance. Woodsorba standard panels meet BS476 Class 3 fire rating. The panels are finished with a lacquer to give it a high quality finish as standard. If special fire treatment is required, the real wood veneered panels (but not the laminate or the painted finishes) can be treated with proprietary intumescent varnish. Therefore upgrading the timber panels to Class 1 or Class 0 (for solid panels pertaining to BS476 Part 7 and Part 6). WOODSORBA panels are easy to maintain. The panels can be cleaned with non-abrasive cleaners, which are suitable for wood veneers. Toughsorba has a Euroclass B-s1,d0 fire rating. This is equivalent to BS Class 0 fire rating in the United Kingdom. An almost unlimited range of colours are available – almost every colour tone from popular colour systems such as RAL, NCS or BS colour, subject to minimum single batch order quantity. Toughsorba is simple to maintain by just vacuuming periodically. Any damage can be spray painted. Ask for painting guide. Panels age naturally under U.V. light conditions like all natural products. Toughsorba panels are manufactured from Spruce wood and water and a bonding agent of Magnesite. The Spruce wood is from sustainable forests and FSC and PEFC approved.